When you’ve heard one bagpipe tune, you’ve heard them both . . . (Jack Finney) – updated 7 November 2018 | A balanced diet . . .
Bagpipes are maybe an acquired taste. For many Scots the skirl o’ the pipes is a profoundly cultural expression, but bagpipes are not – contrary to popular perception – a peculiarly Scottish ‘invention’. Indeed, many countries have their own indigenous varieties, and the Scottish version has been adopted widely around the world. Macalester College in St Paul, Minnesota, where my elder daughter Hannah graduated in 2000 has its own pipe band, and many of its staff and student members have little or no ‘cultural’ attachment to the instrument. The band is very much in evidence during annual commencements and at other events in the state. Pipes are a very emotive and emotional instruments. I am actually quite fond of the sound of bagpipes, and can confess to the odd raising of hairs on the back of my neck when hearing a pipe band, or even a lone piper playing a pibroch. Besides the Scottish pipes, I particularly love the softer sound of the bellows-blown Northumbrian small pipes, outstanding in the hands of a virtuoso piper like Kathryn Tickell. And, of course, there are the Irish or uillean pipes, also bellows-blown. Maybe it’s in my Irish genes, but the sound of the Irish pipes in the hands of someone like Paddy Maloney of The Chieftains never ceases to inspire me. Just yesterday I came across a couple of videos on YouTube that really caught my attention, and inspired me about the talent of so many young musicians. Here are just a couple of examples featuring young female pipers. And in both videos they play the same air, Táimse im’ Chodladh, but their styles are quite different. Amy Campbell is a blind musician from Ireland who has really taken to the uillean pipes. In this video, recorded in 2016 (when she was sixteen) at the Kennedy Center in Washington, DC she is joined by pipers Gay McKeon (on the left in the video) and Emmett Gill. She plays pipes without the drones that you can see played by the other two. McKeon teaches blind children how to play [and] noted what an amazing achievement it was for Amy. Amy has a condition known as optic nerve hypoplasia, a genetic condition that carries with it a many other medical challenges. In this video she talks about her love of piping. Having watched that video, YouTube then ‘offered’ me another featuring Catherine Ashcroft, playing in Northern Ireland in 2014. There are two very interesting facts about Catherine. First, she’s self taught, and that must have been a great challenge to master such a notoriously difficult instrument. Second, she’s English, from Cumbria in the north of England. She has no Irish piping heritage to fall back on. Performing with Belfast guitarist and singer Maurice Dickson as Mochara, Catherine has made a name for herself on the folk scene in the UK. I also read that she was invited to tour with Riverdance in China. Some pipes purist aficionados think her piping a little brash (my interpretation of their comments), but all acknowledge her skill and talent, and given a few more years experience will develop into an even finer piper. I’m impressed (and a little envious)! 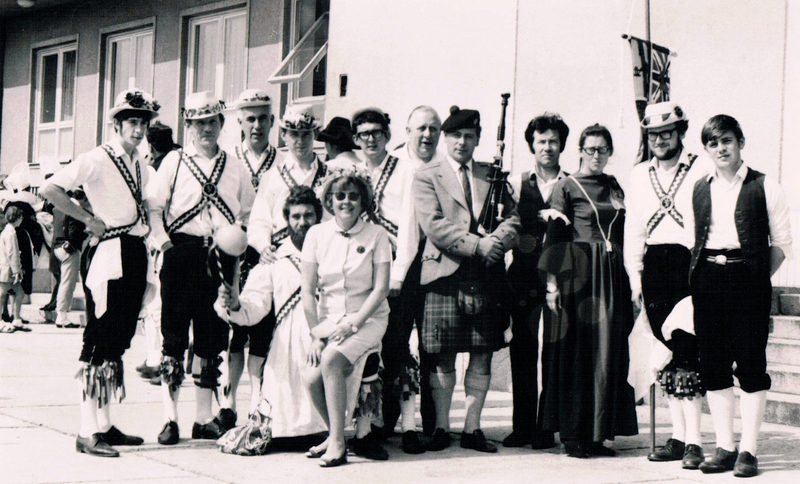 I’ve mentioned bagpipes in a couple of previous posts about morris dancing, and my first trip abroad. 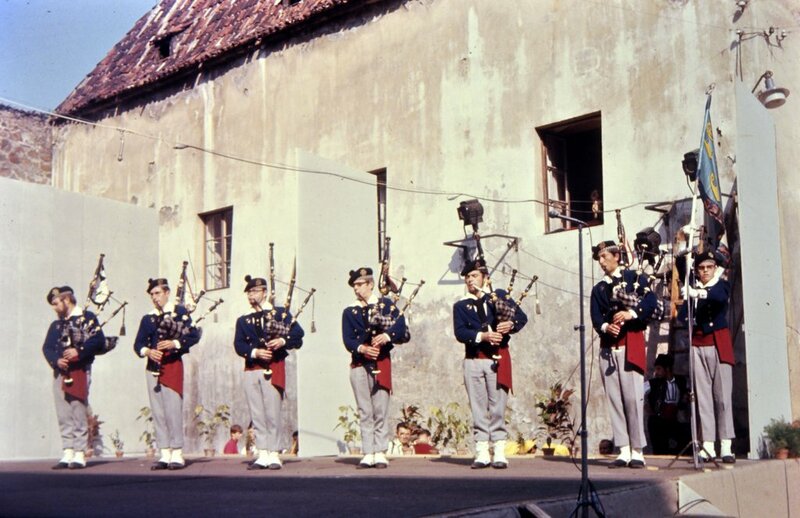 Now let me recount that visit to Strakonice in Czechoslovakia in September 1969 to attend the Second International Bagpipe Festival (Mezinárodní Dudácký Festival). 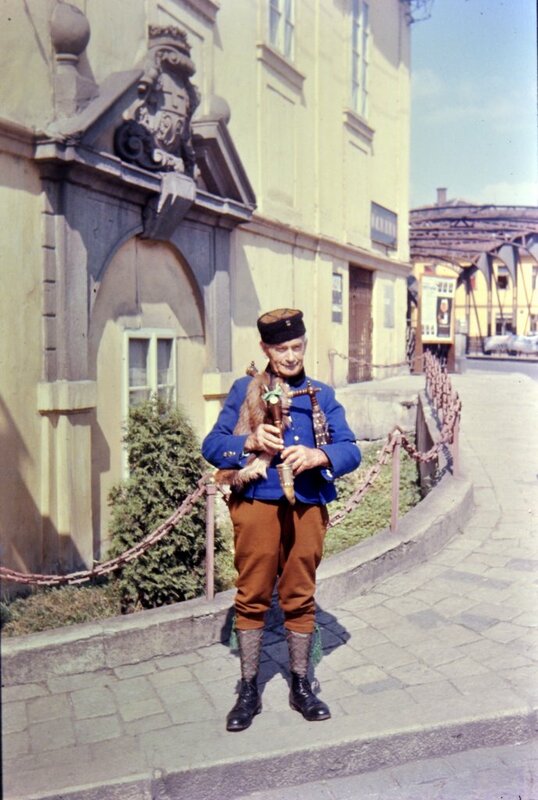 Czechoslovakia has a long tradition of bagpiping, and one of the foremost pipers, and founder of the Strakonice Festival, is Josef Režný. Forty three years later the festival is still held every two years, with the latest taking place in August this year. However the festival is not just about piping as such, but also about pipe music as an accompaniment to folk dance. I joined a group of pipers and dancers from Newcastle upon Tyne in the northeast of England (along with two fellow dancers from Southampton University – Dr Joe Smartt and Russell Meredith) organized by renowned Northumbrian piper Forster Charlton. 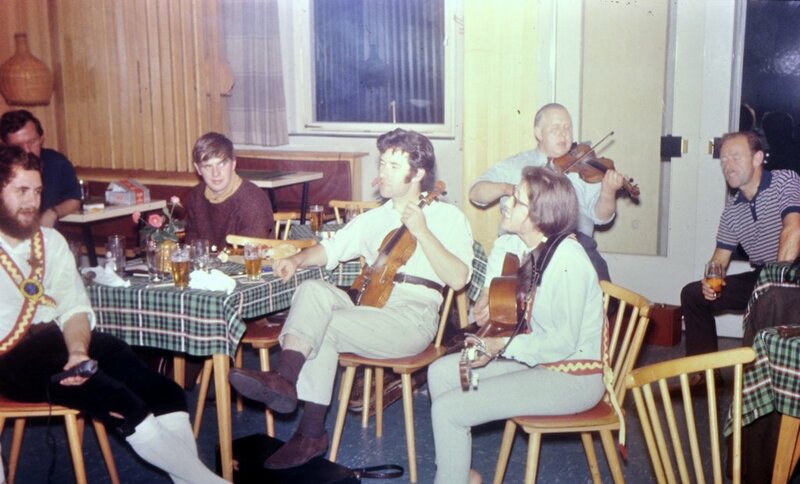 The group also comprised fiddler and piper Colin Ross of High Level Ranters fame, and his wife Ray Fisher, a well-known and respected Scottish folk singer (formerly dueting with her brother Archie Fisher). Joe, Russell and I landed in Newcastle one weekend in early September, were met at Newcastle Central by Forster, and taken to various abodes for the weekend. Meeting up that first evening, we agreed that we would put together sides to dance Morris and rapper. 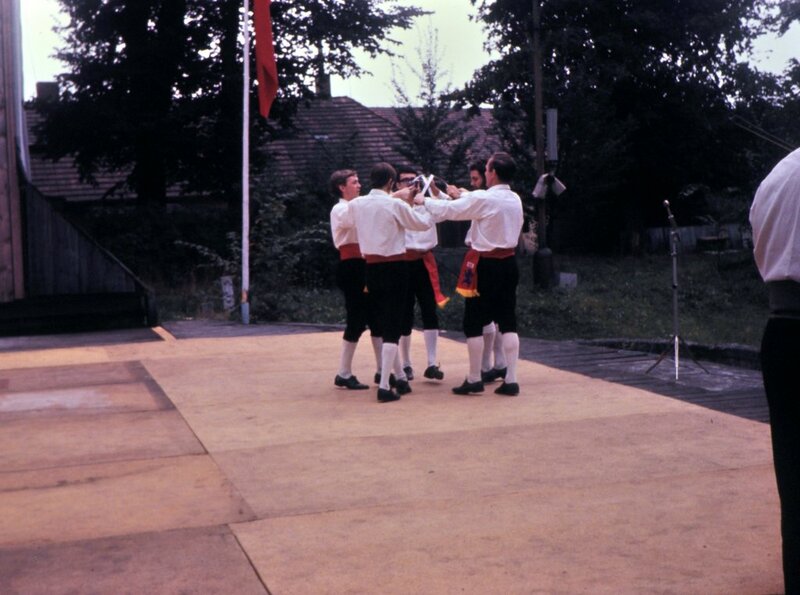 Now although neither of these traditions are performed to pipe music, it was one way of showing something of the dance traditions of England, besides having world-class pipers in the group. We spent the weekend dancing around the working men’s club in colliery towns and villages near Newcastle, and I was introduced to the rigors of rapper sword dancing. The rapper dance steps are quite intricate – think of tap dancing or maybe even Riverdance, and you’ll get the idea – and I had no idea before that weekend of what was involved. I quickly learned the various moves, but the stepping alluded me for quite some time. Overhearing one old timer in one of the clubs criticizing my lack of stepping ability, one of the team – Les Williamson – quickly explained that I’d only been dancing rapper for a couple of hours. I think the old fella was quite impressed! 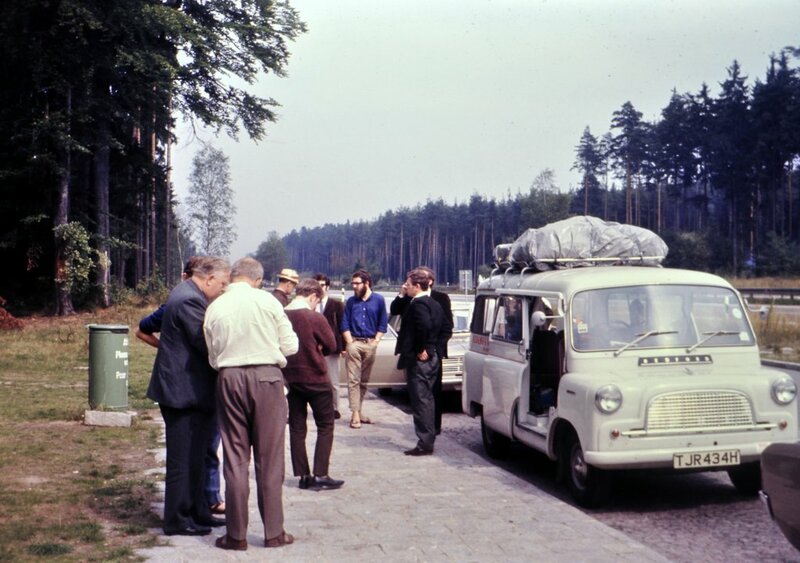 On the Monday we set off in an old Bedford minibus and a car for Harwich to take the overnight ferry to the Hook of Holland, and the 970 km drive from there to Strakonice. We were rather bleary-eyed in the Hook of Holland, but that didn’t stop some impromptu dancing on the quayside. 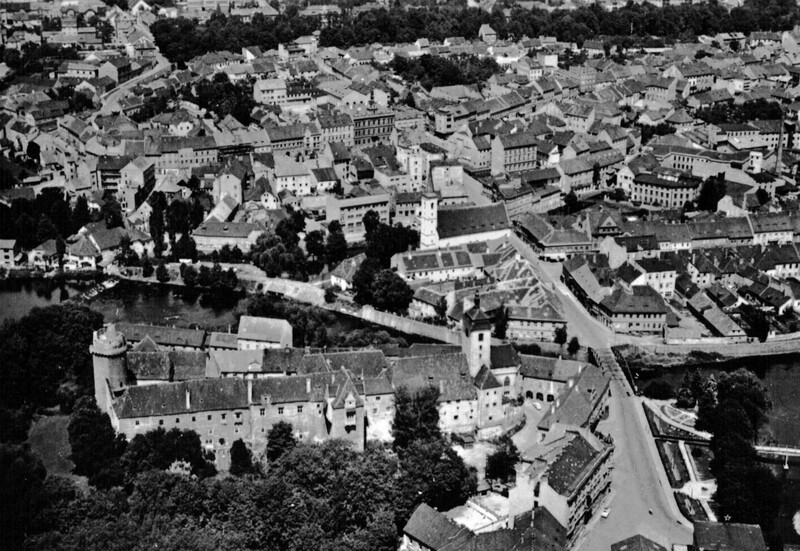 We stopped for a night in a hostel in Offenbach near Frankfurt, continuing on the next day via Nuremberg and into Czechoslovakia (now the Czech Republic). 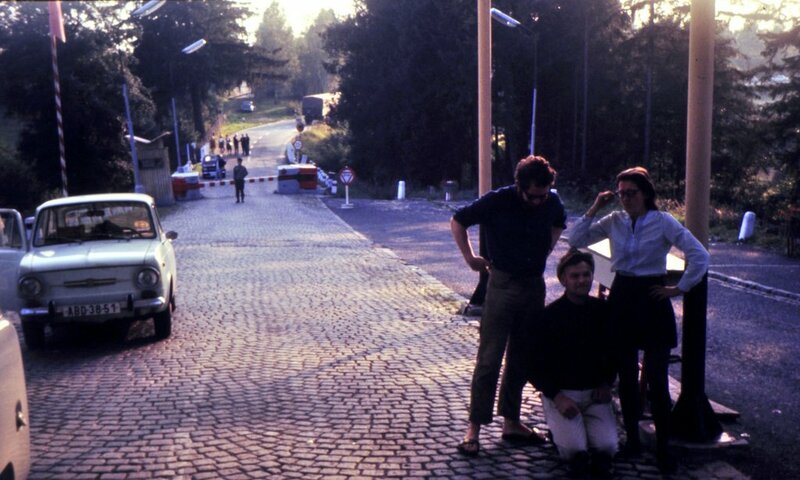 Those were pre-Schengen days when we were stopped at the German border and informed, in no uncertain terms, that we should pay a special road tax or turn around and go home. Crossing into Czechoslovakia (a Communist country, just one year after the Soviet invasion after the Prague spring of 1968) was not as difficult as I guess we all had anticipated. Our accommodation was not in Strakonice itself, but in a small village about ten or more kilometers away. Not that this was a problem, but since our participation in the festival was sponsored by the local brewery, the drive back at night (with wild boar crossing the road on one occasion) was not without incident. We had our midday and evening meals in a local factory, manufacturing textiles if I remember correctly. The food left a lot to be desired. 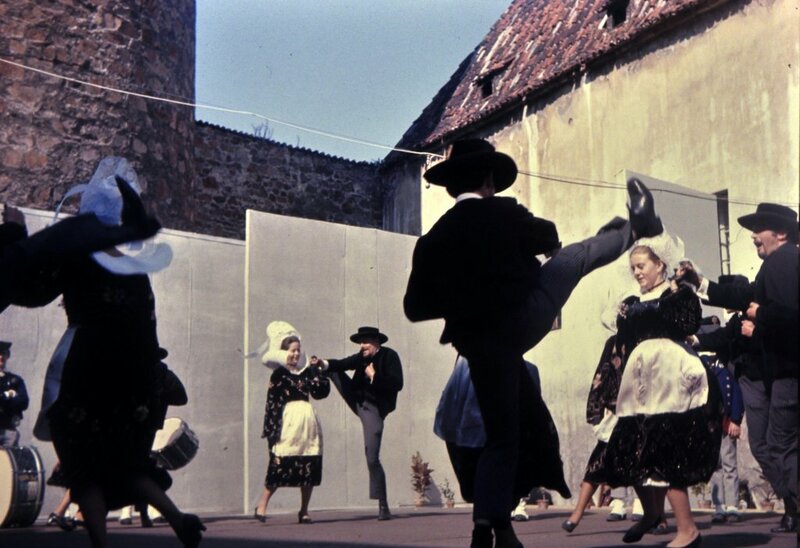 The festival itself involved both staged performances in the castle, as well as impromptu performances around the town. There were pipers and dancers from Brittany (from Brest and Concarneau), from Romania and Bulgaria, and from Czechoslovakia itself. 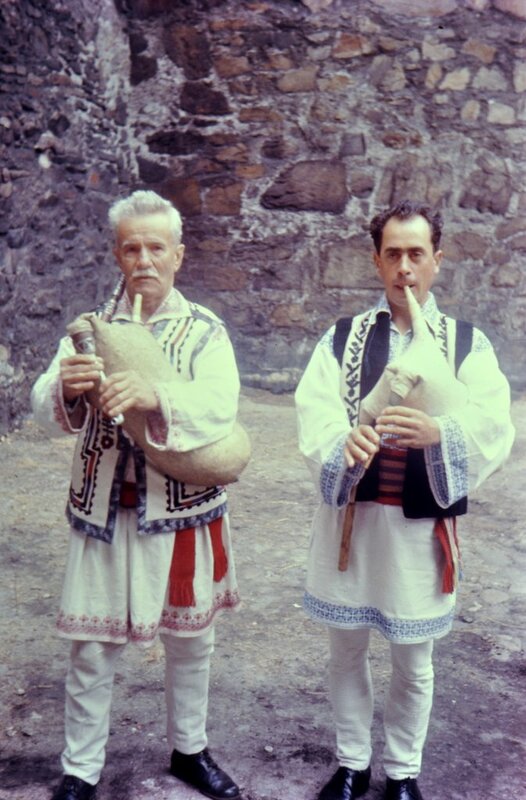 The Brest pipe band, Kevrenn Brest Sant Marc, played the highland pipes, but the pipes from Romania and Bulgaria looked like the skin of a sheep for the bag, and the mouthpiece, drone and chanter fastened into the neck and front legs. There was great camaraderie among all the groups, and lively competition. The highlight was the grand parade through the town, shown in the 2012 video above. The music and dancing were wonderful, especially the haunting Celtic melodies of the Breton band and dancers. It was great to be part of such a vibrant festival – and something quite unlike anything else I’d ever experienced. On one occasion, each group was asked to send a delegate to a civic reception hosted by the town authorities. I drew the short straw, since the brewery sponsoring our stay had invited our group over to the brewery to sample some special lager they had prepared in our honor. I was disappointed to miss that, and to put up with what I expected to be a rather formal and somber afternoon of speeches. Yes, there were speeches, but there were also many toasts of very strong plum brandy or slivovitz from the mayor and his colleagues to us, but then becoming a free-for-all as each group member returned the compliment and we began to toast each other. Needless to say it didn’t take long to become extremely intoxicated! All too soon our stay in Strakonice was over, and we headed west to the Hook of Holland and the ferry home. I kept in touch with Les Williamson for a couple of years, since we met through the Inter-Varsity Folk Dance Festival. 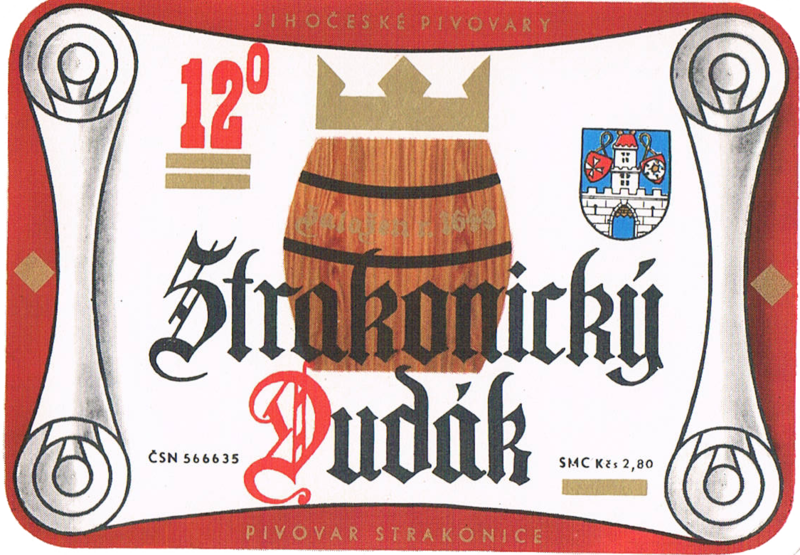 The Strakonice rapper team formed the nucleus of the Sallyport Rapper that is still going strong today (click here and here for stories that mention the Strakonice trip). 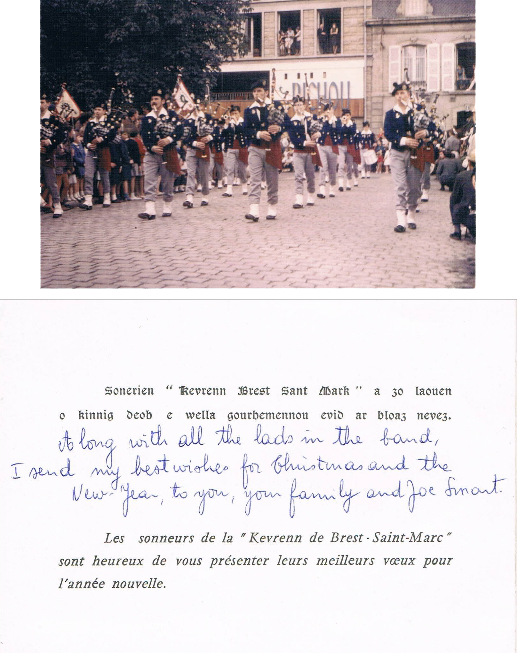 The leader of the Brest pipe band, Gilles, sent me some tapes of their music, and a Christmas card in 1969. Almost fifty years on, the memories are still vivid of that first trip abroad. 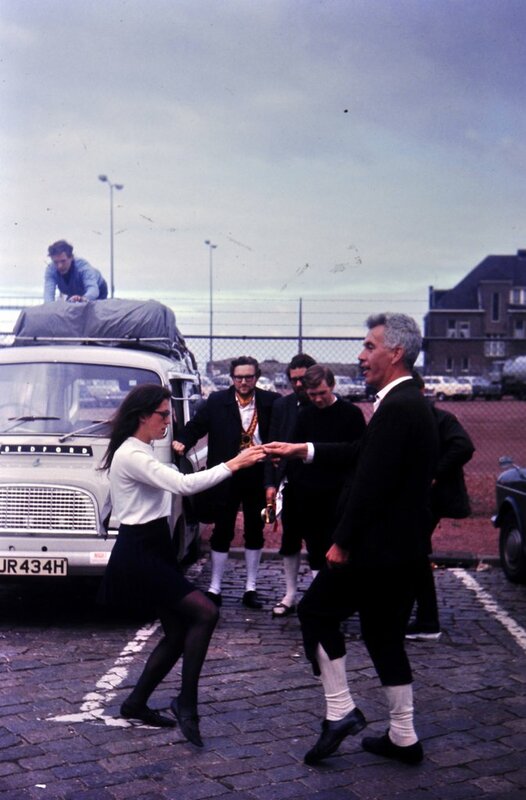 This entry was posted in Musings from the past, Out and about and tagged Amy Campbell, Bagpipe, Catherine Ashcroft, Czechoslovakia, morris dancing, Strakonice, travel.